By the Word of God who appeared for our sake in the flesh. We know of Saint Julia, otherwise known as Julitta, from the life of Saint Euphrasia, who is also called Eupraxia (July 25). They both lived as nuns at a monastery of one hundred and thirty nuns in Tabennisi, Egypt. We are told they were both close companions who loved each other very much and encouraged each other in the struggles of monastic life. It appears Julia was older than Euphrasia and was like a teacher to her. When Euphrasia was tempted by the devil or when the devil tried to kill her, Julia was there to help her. One day the abbess of the monastery had a vision which left her in a state of extreme distress. The senior sisters noticed and began to question her about it. "Tell us, my lady abbess, why you are going around groaning, and giving us such cause to worry about you." "Don't press me on that until tomorrow." "Trust us, my lady. If you don't tell us what it is, it will only make us more and more worried about you." "I'm worried about something in the future, and I didn't want to tell you about it until tomorrow. But seeing you are pressing me, listen: Euphrasia is going to leave us. Tomorrow her life here comes to an end. But don't upset her by telling her that." The senior sisters cried out in distress at what the abbess had to say, and continued to lament for quite some time. One of the sisters, as soon as she had heard this, ran to the bread oven where she found Euphrasia cooking bread along with Julia, her usual companion. "Sister Euphrasia," she said, "you ought to know that the abbess and the senior sisters are in a terrible state of grief because of you." Julia and Euphrasia were bewildered, and just stood there open-mouthed. "Perhaps she has heard a rumor," said Julia, "that your former fiancé has persuaded the Emperor to order your removal from the monastery, and that is what she is upset about." "As my Lord Jesus Christ lives," said Euphrasia, "not even if the foundations of the whole round world were shaken, could I be persuaded to abandon my Lord Christ. Do me a favor, sister Julia, while the bread is cooking, go and see if you can find out what the problem is and set my mind at rest." Julia went and stood outside the abbess's door, and could hear her still talking about her dream. Saints standing around looking on, and I saw the Mother of the Lord taking Euphrasia - truly! - and leading her to the nuptial couch, where there was a beautiful crown prepared, and I heard a voice saying to Euphrasia, 'Behold, your reward. Now hurry and come here in ten days time, to enjoy these things for endless ages.' That was nine days ago, when I saw the vision, so tomorrow Euphrasia will die." As Julia listened secretly to the abbess's story, she began to beat her breast and face. She wept and returned to the kitchen, where Euphrasia was alarmed to see her in tears. "For the sake of the Son of God, sister Julia," she cried, "tell me what you have heard and what you are crying about." "I am weeping, dear sister, because today we shall be parted, so I have heard the lady abbess say. Tomorrow you will breathe your last!" Euphrasia was shocked at hearing this, and sat down completely distraught. Julia sat down beside her, weeping. "Give me your hand, sister," said Euphrasia, "and help me to where the firewood is kept and leave me there. I will leave you to take the bread out of the oven and take it into the monastery." This Julia did, saying nothing as yet to the abbess. That night Julia and Euphrasia were left alone in the church to keep vigil. "My dear sister, do not forget me. Remember how closely we have always been united on this earth. Pray to God that I be not separated from you. Remember how I have shared in your battles. Pray to the Lord that he will release me from the burden of this flesh in sure hope that I may be found worthy of being with you." The next day Euphrasia reposed in peace, being just thirty years old, and was buried at the monastery next to her mother. It was Julia who had taught her how to read and how to sing the psalms, and she had loved that pupil of hers who had belonged to the Emperor's family. She wept for three days without leaving Euphrasia's grave. On the fourth day, however, she felt quite happy and went to the abbess to tell her why. "Pray for me, my lady," she said "for through blessed Euphrasia's intercession Christ is calling me." 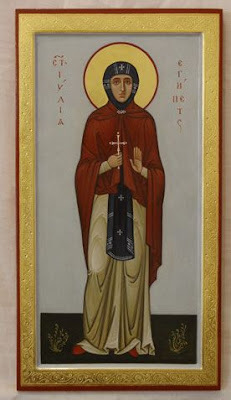 She kissed all the sisters, and on the fifth day after Euphrasia's death her teacher Julia died also, and was buried in the same tomb as the blessed Euphrasia. Thirty days later the abbess summoned the senior sisters. "My daughters," she said, "you must choose someone else as a mother to take my place and preside over you." "Why are you saying this, my lady? Tell us! You have never spoken to your servants like this before." "The Lord is calling me," she said. "Sister Euphrasia has been praying very diligently for me, so that I too may merit a heavenly marriage bed. Julia also is sharing in what Euphrasia has been granted and has entered into that palace not made with human hands, and I too am hastening on the way to being found worthy of sharing that place with them." The sisters rejoiced at hearing of the great glory which Euphrasia and Julia enjoyed, and prayed likewise that they all might deserve to be partakers of such a marriage. They chose one of the sisters called Theogenia to preside over them.